Whether you're a teacher from traditional or Rotation-style Sunday School, you'll find inspiration for your creative teaching here in the Team's lesson sets. Writing Team Bible Backgrounds and Lesson Summary Pages are open to the public. Access to the Team's creative lesson plans is the major benefit of being a Supporting Member. Join now. Writing Team Sets are in addition to all the wonderful lesson resources found in our public lesson forums. From 2015 to early 2018 we revised or replaced every single Writing Team lesson set written in the early years of the Team. Our goal was simple: To do our best instead of taking a rest. We have begun writing new sets for new stories as well. Want to join our Writing Team for a set or two? Email Neil. An Advent Lesson set that looks at Isaiah's Old Testament's hope for a Messiah, and the kind of King that was coming to save God's people -- Jesus! Who is this young girl chosen by God to give birth to and raise our Lord? Learn how her servant spirit and overflowing heart sets the tone for our servant spirit and Christmas celebration. Matthew 1:18-25, the angel's announcement to Joseph and Luke 2:1-7, Journey to Bethlehem and Birth in the Manger. This set is open to everyone! It's a great example of the creativity and level of detail you'll find in other Team Lesson Sets. Free registration required if you are not already a Registered or Supporting Member. What does it mean to "bow down and worship" him? How are you like a camel? Where is this "east" Matthew talks about? These six workshops feature many creative teaching methods and insights into this familiar story. Be like Jesus in Sunday School and in Worship! 7 creative workshop-style lessons exploring the temptations Jesus faced, and how he may have prepared himself during his time in the wilderness to resist temptation and commit to God's plan. Jesus tells the Disciples to let out their nets and become fishers of people. How are you called? and What are you called to do? Jesus teaches us the kind of attitudes we need to see and serve him in his Kingdom. Being "born from above" means seeing from God's point of view, that's how you see and enter the Kingdom, according to Jesus. We try to walk on water, but we sink. Thank God Jesus is there to catch us. It's a humbling experience, and maybe that's the point. What is the kingdom of God like? Where is the Kingdom? And how are we part of it? In one of the most important stories of the New Testament, we learn that Jesus has the power over death and wants to give us life. Palm Sunday ~ Jesus is the One! Hosanna Hey! The story which begins the events of Holy Week. Additional Scriptures Referenced by some lessons in this set: Exodus 12:1-42 The Passover, Mark 14:12-26, Luke 22:7-20, John 13:1-30 Jesus washes the disciple's feet, 1 Corinthians 11:23-26 Paul repeats Jesus' "words of institution." "Struggle" is an important part of this story - Jesus’ struggles to accept God’s plan, the disciples struggle to stay awake, and we struggle to follow Jesus. God's love is bigger and stronger than whatever you fear. This super-creative set of lessons tackles a long but important story with some creative and kid-friendly techniques. Among its many great ideas, it includes a Cross Seder Cooking Workshop, and a "Reflection Stations" Workshop that incorporates traditional and contemporary Christian songs. Learn about the woman who was the first witness to Jesus' resurrection and what the Empty Tomb means for us today. Jesus reveals his presence, which gives us the faith and confidence to share the good news with others. A rich post-resurrection story featuring the "restoration" of Peter who leaps from his boat to be with Jesus, and then Jesus commands him, "Peter if you love me, feed my sheep!" Six terrific lesson plans, including a Music-Drama lesson, "Road Signs" Art Workshop, and an honest review of a dozen Jesus films which depict these stories -with our two video recommendations. A super-creative set of workshops focused on the story and meaning of the Holy Spirit's advent on Pentecost. Includes a blacklight Movement & Music Workshop, a Spirit-powered model rocket launch, and leaf-blower inspired Bible Skills & Games Workshop. Saul's life and faith were dramatically changed by his encounter with Jesus on the Road to Damascus, and ours can be too! 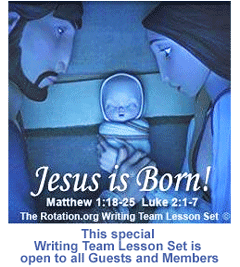 Why hasn't the Writing Team written lesson sets for other popular New Testament stories? We do plan on writing more sets! The Team was originally tasked to write great lesson sets for MAJOR stories that didn't have a lot of good material in the public lesson forums. Having developed a new creative standard and level of detail for lesson plans, the Team is now working on writing sets for ALL the major stories of the Bible which Elementary Age Kids need to know. What about "other" Bible stories? In the Rotation Model, we believe in teaching the "major" stories of the OT and NT for at least four weeks in a row through various workshops. Because we don't change the story every week, we move more slowly and deeper through the Bible than traditional Sunday Schools do. This means we have to PRIORITIZE which stories are important for children to learn, and which are better left for older students and other times and place. That means we "focus on the majors." A typical Rotation Model Sunday School will teach between 8 and 12 Bible stories a year. That means over 5 years, our elementary students will learn around 50 stories (because some stories repeat, like Advent), and they will learn them in greater depth. How do we decide which stories to teach in the Rotation Model? Among Christian educators, there is a general consensus about the top 40 or so Bible stories that are important to teach to children. The Rotation Model focuses on those, especially because we're going to spend 3 to 5 weeks on each. The Writing Team follows this consensus list (often called a "Scope and Sequence"), and then writes sets on those stories only if the public forums don't provide enough great ideas and lessons on that story. Learn more about the consensus "Scope and Sequence" of major stories a Rotation Sunday School will teach, and how those stories are picked. Traditional Sunday Schools picking from the Team's sets find super creative options for key Bible stories, and often get inspired to do more than one week on them --because they have the Team's great lessons to do so.